Welcome to New Chamber Member! Come celebrate for the ribbon cutting at 11:00 am, or swing by during the day to tour Pampered Paws facility and learn about the many services they provide in addition to boarding, like training or pet sitting. The Bonham Chamber of Commerce is welcoming a new member, and we’d like to tell you all about it. Pampered Paws Dog Hotel and Pet Sitting, owned by David and Shari Gearhart, opened its doors to the critters of Fannin County September of 2016. 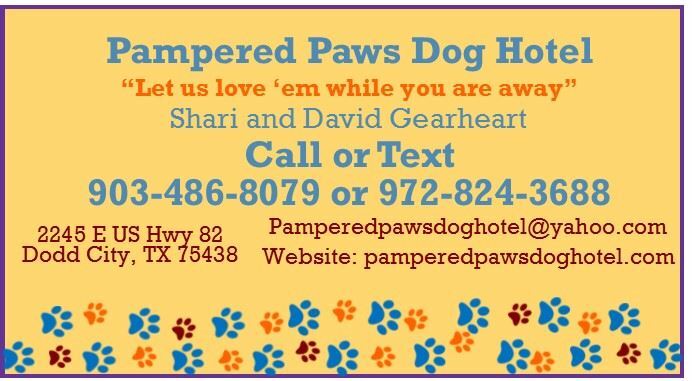 The Gearhart’s started out with pet sitting three years ago and have now expanded to boarding pets on their property and in their home located just east of Bonham at 2245 E US Hwy 82, Dodd City, TX. Pampered Paws has 8 welded wire kennels as well as in home care for smaller breeds, and the Gearharts would love for you to come tour their facility and learn about the services they provide. Visitors are welcome to drop by any time Friday, May 5th, or Saturday May 6th, between 9-5. The Chamber will hold its Ribbon Cutting Ceremony on Friday May 5, 2017 at 11:00am. Thinking about traveling this summer but have pets? A drawing will be held for a 1 week and a 3-day guest certificate up to two pets for attendees, and winners will also be posted in the news. Join us in welcoming Pampered Paws Dog Hotel to our business community and get in your reservations for summer vacation. Contact Shari Gearhart at 903-486-8079 or David Gearhart at 972-824-3688. Find them on the web at pamperedpawsdoghotel.com for details on dog boarding and pet sitting.